I built one of these last week and it really works!!! I have just confirmed it. One of my girlfriend's friends came over and she said the smell was almost gone. I built it for a little over $70. I looked at buying one but they are $200-$300. I highly recommend you make one if you keep your snakes in the house. It gets rid of about 95% of the smell from my 48 snakes, 12 geckos, and 4 level rat rack. I hung mine on the wall and I keep my ceiling fan on low to help circulate the air. A++++ Thanks Jake!!! The only down side to all my animals was the smell but this has gotten rid of it. The website for the canister says it works for about 18 months... In your experience, is that pretty accurate? 18 months is fairly accurate, give or take a couple of months. These can filters can also be popped open so you can replace the carbon with a jar of activated carbon from Wal Mart for about $10. 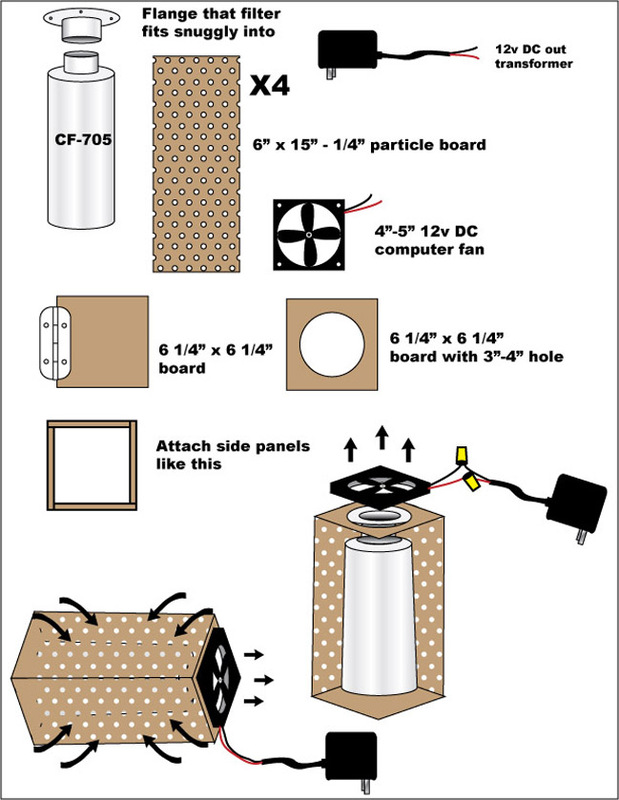 If you are clever, you can also build your own larger version using a 2.5 gal bucket and 4"-6" PVC using a drill, a poly fiber pre-filter and some mesh or vinyl screen. I think I can somewhat picture how your homemade 2.5g bucket idea would work...but just in case, I made a quick diagram to see if we're on the same page. So I've got the exterior bucket as the 2.5g bucket. It has holes drilled in it to allow air to pass through the activated charcoal. The PVC pipe is mounted to the center of the bucket. 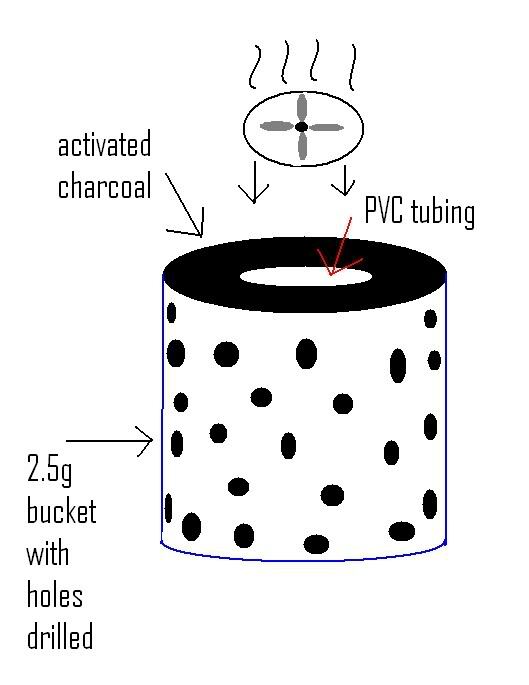 The space between the PVC and bucket is filled with activated charcoal. The PVC pipe is empty and also has holes drilled in it. And attached to the PVC pipe is a fan sucking the air through the bucket and out the 'top'. And some type of screening or cloth is glued to the inside wall of the bucket and on the outside wall of the PVC? Is this pretty accurate? Or do there need to be any changes? Also, does the top need to be air-tight, or does the fan mount to the PVC pipe only have to be fairly airtight to maximize the air pull? That's about it. I would make it as air tight as possible so the only air getting pulled is forced to go through the carbon. When I first saw your post I thought you had the PVC filled with carbon, so I drew these up. I guess I should have read more carefully. Anyway, here's how I would do it. It's the same as your diagram, pretty much just adding a coupler and an end cap. You would cut a 4" hole in the center of the bucket lid, drill a bunch of 1/2" holes in both the PVC tube ad the bucket, then glue the vinyl mesh around the outside of the PVC and the inside of the bucket. Put the end cap on the tube, stick the top of the tube through the 4" hole in the lid, and secure it in place, in the bucket, with the coupler. 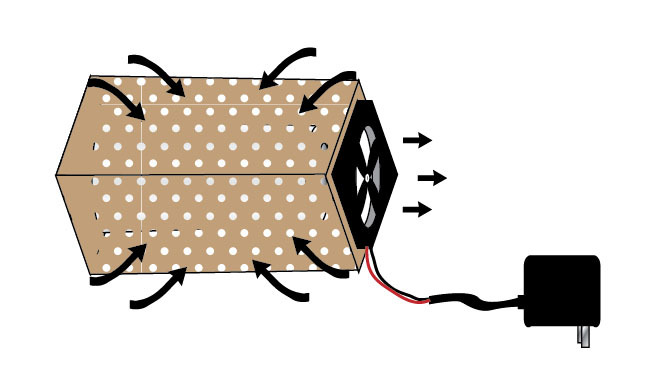 Glue the fan, blowing up, into the coupler with the leads running out to a 12v wall transformer. Secure a sheet of 9" tall polyfiber around the entire outside of the bucket for a pre-filter, then fill the bucket up with the activated carbon. Awesome. Thanks for the clarification Jake! does this take care of rat smell or just reptile smell?